Combine shallots, oil, vinegar, orange juice and lemon zest (if using) in a small jar with a screw-top lid. Shake vigorously until well-blended. Season to taste with salt and pepper. 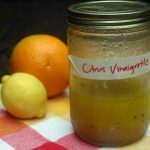 Experiment with combinations of orange, lemon, and lime juices and different flavored vinegars.